EyeBuyDirect.com guarantees all information is kept secure and private, We will never make your information available to a third party. By sharing us with your friends, we'll give you $10, and your friend will receive $10 off their first purchase. As a bonus, you'll receive $50 every time you hit 5 new friends. Questions? Click here to learn more. 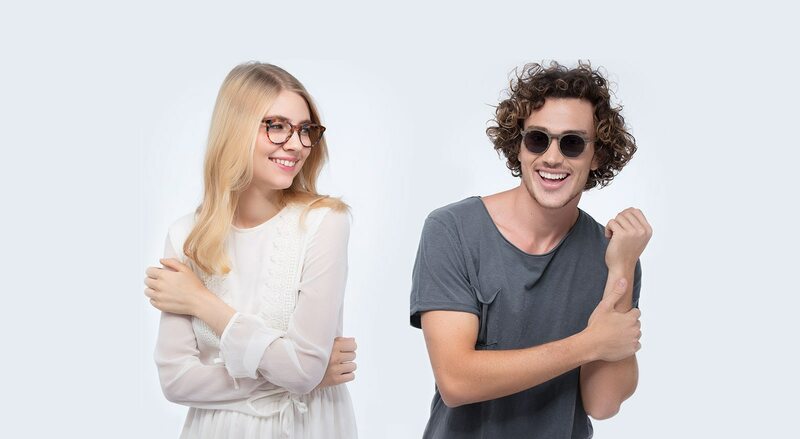 Inviting your friends to EyeBuyDirect can earn you credit towards your next purchase. To begin earning credit, share your personal coupon code or link by email or social media to give your friends $10 off their first order (this order's final total must be $50 dollars or more AFTER application of the referral coupon code for you to obtain the referral benefits.). Once they have made a qualifying order, you will then receive $10 EBD credit. Each time you have a total of 5 new friends who have made a purchase, you will receive an additional reward of $50 EBD credit. Plus! For each friend you refer who makes a purchase on our site, we will reward you an additional 10 points towards your Focus Loyalty Program membership. To qualify for the $10 savings, referred friends must place an order using the referral link or the coupon code they received from you. This order's final total must be $50 dollars or more AFTER application of the referral coupon code for you to obtain the referral benefits. Shipping is not included. The friends that you refer must be first time customers in order for you both to enjoy the $10 rewards. All referred friends placing an order using their $10 reward cannot apply promotional coupons at the same time, as we do not allow multiple discounts. When using a referral link, the coupon code will be automatically applied to your cart. If you prefer to use the coupon code, it must be manually added at checkout. All EBD Credit obtained through the referral program will automatically be accumulated in your EBD account. At checkout, you will find a dedicated EBD Credit section where you can enter the amount of credit you wish to use, up to a maximum of $50 EBD Credit per order. When a referrer uses EBD Credit to purchase on the site, it is possible to pay a part with EBD Credit and another part using a different payment method, e.g. credit card. EBD Credit can be used together with a gift card. EBD Credit cannot be used to purchase EBD Gift Cards. If a refund is given, the entire amount of EBD Credit applied to the original purchase will be returned to the EBD account. EBD Credit cannot be exchanged for money or any other currency. If a refund is issued for any purchases made with EBD Credit along with another method of payment (credit card, PayPal, etc. ), any EBD Credit applied to that purchase will be refunded to your EBD Credit balance while the rest will be returned via whichever payment method(s) you originally chose, with priority first given to EBD Gift Cards, then to EBD Credit for partial refunds. There is no time limitation for the use of EBD Credit attached to an EBD account. EBD Credit will be delivered to the referrer 14 days after the referred friend's order has shipped. If a refund is given to the referee within the 14 days of delivery, the $10 reward credit will not be applied to your EBD account. Customers will only receive credit for a total of 25 referred individuals maximum. Referral codes cannot be paired with other promotional codes or any items currently on sale. The total number of times a code has been used includes the number of times it was used in our previous referral programs. For some customers, this may result in zero EBD Credits earned as no purchase has been made with our new Referral Program yet. EyeBuyDirect reserves the rights to make changes to, or cancel this program at any time.